It’s Labor Day weekend already (go here to see which Trails of History sites will be open on Monday). Where does the time go? August 31-Sept. 1: Railfest 2013 activities—Scranton Iron Furnaces will host a Civil War encampment and present guided tours of the site (you can take a shuttle from Steamtown NHS if you’re attending other Railfest events). 9 am-5 pm. Sept. 28: Revolutionary War Encampment—reenactors, house tours, craft demonstrations and other activities. Admission charged; check the website or call 610/459-3342 for information. 10 am-3 pm. Sept. 14: Fall Lecture—Speaker David Wilmes will discuss his book, All the Exertions of Courage: The Battle of Bushy Run and the Struggle for the Pennsylvania Wilderness. Cost is $5, free to members of Bushy Run Battlefield Heritage Society. 1 pm. Sept. 1: First Sunday—the site will be open today, noon to 4 pm. Sept. 8: Weiser Interpretive Sunday—historical reenactors help bring the site and its history to life. Noon-4 pm. Sept. 21: 33rd Annual Conrad Weiser Disc Golf Tournament—Registration starts at 8-9:30 am, tee-off at 10 am. Contact Mike Dunkle, mdunkle@verizon.net, for info. Sept. 10: Lecture—featured speaker Jan Morrissey will talk about The Historic Preservation Trust of Lebanon County and its mission to raise awareness for historic preservation and to identify sites of exceptional architectural and historic merit. (Go here for more info.) Part of the Friends Lecture Series held in Freeman Auditorium at Cornwall Manor. Free and open to the public. 7 pm. Sept. 21: Cast Iron Cooking Demonstration—learn about cast iron cooking pots and see them in use. Demonstration is free. Regular admission fees apply for tours of the Furnace (see where cast iron comes from). Demonstration 11 am-3 pm; museum is open 9 am-5 pm. Sept. 1, 8, 15, 22, 29: Interpretive Sundays—each week features a hands-on activity or demo of 18th-century crafts or skills; 9/1-Soap Making, 9/8-Textile Processing, 9/15-Basket Making, 9/22 & 29-TBA. Included in regular admission. Noon-4 pm. Sept. 15: Basket Making Workshop—in addition to the demonstration, up to 15 people can participate in a workshop to learn colonial basket making techniques. Contact the site, 610/582-4900 or info@danielboonehomestead.org, to register. Fee is $35 to make an antler basket, $30 for a potato basket. Sept. 1: Historic Pithole open—last day of the season for the visitor center exhibits and orientation film. Free admission; donations gratefully accepted. 10 am-4 pm. Sept. 19: Heritage Lecture Series—Roxanne Hitchcock, “The Well Tender: A Civil War Soldier’s Journey from the Battlefield to the Oil Field.” Special admission. 6 pm. Sept. 21: Fall Gas Up—the Pioneer Steam and Gas Engine Society will display antique gas engines on the grounds of the museum. Included in regular admission. 9 am-4 pm. Sept. 28: Oil Valley Blacksmiths—this is a monthly demonstration program held the last Saturday of the month from April through October. Included in regular admission. 9 am-2 pm. AND Drake Well by Moonlight—a special evening event with tours, food, music, and more (go here for info). Special admission. 6:30-9:30 pm. Sept. 15: Ethnic Music Festival—enjoy music by the Donegal Weavers (traditional Irish band), the Pennsylvania Villagers (polka band), and the Hometown Boyz (bluegrass, country, etc.). Food, site tours, and the museum store will also be available; bring your own blankets and chairs. Included in regular admission. Doors open at noon; music begins at 1 pm and continues to early evening. Sept 7: Founders’ Day—Discover the roots of the Ephrata community with a special admission price of $1 (ages 3 and up) and lots of interesting activities on the site. Tickets for tours of the rarely shown upper floors of the Sisters’ House are $12; reservations strongly suggested. 10 am-4 pm. Sept. 21: Artisans Faire—local craftspeople will display and sell their wares. Included in regular admission. 10 am-3 pm. 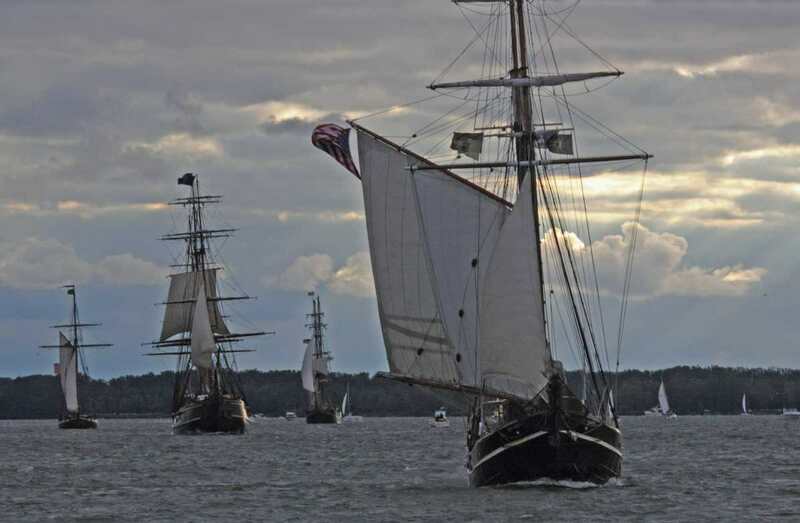 Sept. 5-8: Tall Ships Erie 2013—as part of the 200th anniversary of the Battle of Lake Erie, this event brings together 9 tall ships, musicians, historians, filmmakers, actors, local vendors, and more. The basic schedule is here; go here for info on all the different activities. Most events take place in and around the Erie Maritime Museum or the Bayfront Convention Center. Sept. 18: Homeschool Day—activities include tours of the Keith House, open-hearth cooking, militia drills, and colonial games (click here for flyer). Cost is $6 per person; students must be accompanied by a responsible adult. 10 am-2 pm. Sept. 20: Registration deadline for Senior Day at Graeme Park—designed for older adults and scheduled for Oct. 2. Flyer with full details and registration form is here. Sept. 1, 8, 15, 22, 29: September Ice Cream Sundays—enjoy a lovely Sunday afternoon with wagon rides, live fiddle music, and “make-your-own” ice cream sundaes. Included in regular admission. Noon-3 pm. Sept. 14: Wool Frolic—this is a new event focused on the fiber arts. See demos of bobbin lace making, dyeing fibers, knitting, crocheting, and weaving. (Go here for the program flyer, if for no other reason than to see the artwork.) Admission charged. 10 am-4 pm. Sept. 21-22: Erntefest Harmonist Harvest Festival—Learn how the Harmonists celebrated the harvest and prepared for the winter ahead. Craftspeople will demonstrate 19th-century trades, and hands-on activities include churning butter, making apple schnitz (dried apples), and pressing apples for cider. Homemade German food will be available across the street at St. John’s Lutheran Church. Sat., 10 am-5 pm; Sun., noon-5 pm. Sept. 1: Historic Trades—the blacksmith and joyner will be on hand to demonstrate their work with metal and wood. Included in regular admission 1-4 pm. Sept. 8: Living History Theater—“The Caribbean Connection” introduces Quaker Samuel Carpenter, who has just returned from Barbados and will be talking about his experiences there. Included in regular admission. 1-4 pm. Sept. 15: Open Hearth Cooking—the cooks will be preparing recipes from the “receipt” book of William Penn’s first wife, Gulielma. Included in regular admission. 1-4 pm. Sept. 22: Garden Highlights—it’s beginning to look and feel like fall in Pennsbury’s gardens; come see for yourself. Included in regular admission. 1-4 pm. Sept. 29: Animals at Pennsbury—meet the animals and learn about the work they do (and about the work their historical counterparts did as well). Included in regular admission. 1-4 pm. Registration now open for genealogy workshop, “Finding Your Pennsylvania Civil War Ancestors” on Oct. 5—the second installment of this successful workshop includes a morning session on research resources (limited to 25 attendees) and an afternoon session of research assistance from professional archivists (limited to 10 lucky people). The workshop is free, but registration is required. Act now! To register, contact Josh Stahlman, jostahlman@pa.gov or 717/772-3257. Sept. 28: Members Day—tours, lectures, book signings, and a banquet with speaker Cesar Vergara, president and chief designer of Vergarastudio, specializing in public transportation infrastructure and rolling stock. Click here for details. Sept. 6-8: Mountain Craft Days—since 1970, this event has brought together artisans and craftspeople of all types, and now includes children’s activities, cooking demonstrations, entertainment, and great food. Admission is $7 for adults, $4 for kids 6-17. 10 am-5 pm. Thru Sept. 2: Harrisburg Kipona festival—State Museum archaeologists will be on City Island offering a free program from 10 am to 6 pm. (They will also be conducting excavations at historic Fort Hunter, Sept. 4 through Oct. 11). Sept. 8: Gallery Walk—the museum will be open free of charge, 11 am-6 pm. 1 pm, Artist Conversation in the “Art of the State” exhibit (last day of the show). 2 pm, opening reception for Doshi Gallery exhibit, “Construction/Deconstruction” (runs through Dec. 1). All day, Susquehanna Art Museum’s VanGO! will be parked adjacent to the museum. Sept. 20: 3rd in the Burg—exhibit opening for “Stories from the Homefront: Pennsylvania in the Civil War.” There will also be a book-signing with the authors of The Civil War in Pennsylvania: A Photographic History. Tickets are $40, $35 for State Museum Affiliates and PA Heritage Foundation members (purchase tickets online at www.shoppaheritage.com). 6-9 pm. Sept. 25: HomeSchool Day—a special program tailored for families and community organizations teaching in a home setting. Program fee is $10 per person (free to members) and includes a planetarium show. Register by calling 717/772-6997. 10 am-2 pm. Sept. 22: Market and Muster Day—enjoy a day out as historical interpreters and reenactors get in the spirit of a colonial marketplace and militia drill. There will be activities for families, and the marketplace will include local produce and baked goods in addition to crafts. Cost is $8 for adults (age 12 and up), $4 for kids 5-11. Go here for more info. 10 am-4 pm. For a listing of Trails of History events this weekend and next, go here. Cornwall Iron Furnace’s second annual Blast! event was a success and from the photos posted on Facebook it looks like people had a great time sampling local wine and beer as they supported the site and its other programs. During last week’s Erie Gives online fundraising initiative, the Flagship Niagara League received almost $9,700 in pledges, bringing their three-year participation in the program to almost $28,000 in donations. As part of next weekend’s massive Railfest 2013 at Steamtown National Historic Site, Scranton Iron Furnaces will host a Civil War encampment and offer guided tours to visitors. Go here for more info. Ephrata Cloister’s collaboration with the Lancaster Spinners and Weavers Guild received some good coverage this week. The two organizations joined forces to revamp and maintain a garden at the historic site showing plants used to dye natural fibers in the 18th century. 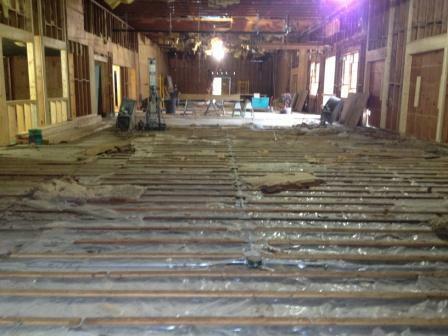 Additional assistance came from Hans Herr House and Landis Valley Village and Farm Museum. Circling back to our school theme (well, it was sort of a school theme), Bucks County Community College will include a case study at Washington Crossing Historic Park in its course on preservation assessments of historic buildings (see story here). It’s been a busy week here at Trailheads HQ, and I’ve barely had time to think about this week’s post. But the folks out on the Trails of History have been way busier than I have, so I’m just going to point you in their direction and let you see for yourself. Mid-August usually means that the summer interns are wrapping up their projects and heading back to school. We had quite a few excellent interns, who have worked with the public, learned about taking care of museum collections, developed exhibits, and much more. Interns at Ephrata Cloister, Pennsbury Manor, Pennsylvania State Archives, and the State Historic Preservation Office all took to the blogosphere to share their experiences. We hope to have some follow-up on the interns’ exhibit project at Old Economy Village in the weeks ahead. Thank you to all of our summer interns and to the staff who served as mentors these past few months. Daniel Boone Homestead has been sharing photos on Facebook from their “Battles at Boone” event last weekend. You can read about the event here or watch a short video here, courtesy of the Reading Eagle. 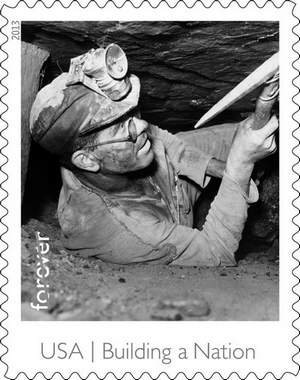 The folks at the Anthracite Heritage Museumrecently shared a link to information on the launch of a postage stamp honoring coal miners, part of the US Postal Service’s new “Made in America: Building a Nation” series. The Museum’s exhibits, tours, and programs, as well as those at Eckley Miners’ Village, also honor and preserve the legacy of coal miners, their families, and the communities they built. Want to see Flagship Niagara docked in Chicago for a tall ships event? Go here (Niagara is photo #2). You can also read about some of the crew here. 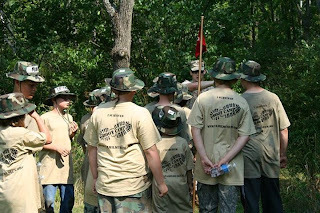 Pennsylvania Military Museum has posted video of their recent "Boot Camp for Kids" program. I'm exhausted just looking at it. Work continues on the expanded visitor center at the Pennsylvania Lumber Museum, and we are beginning to think ahead to the opening of the new building. We’re hard at work on the details for a long-term exhibit in the new gallery space that will look at the history of the lumber industry, changing perspectives on the forest, the conservation movement, and contemporary forest management practices. Pennsbury Manor opened to the public as a historic site in 1939. As part of the lead-up to the 75th anniversary, visitors (past and present) are invited to share their memories of Pennsbury on Facebook (here). Carol Hill recently stopped by to share the journal of her great great grandfather, Thomas Crozier, with Pennsbury’s staff and summer interns. The Crozier family built a home in the 1830s on the foundation of what had been the Penn family’s manor house (no longer standing by that time). The Crozier House was moved when the manor house was reconstructed in the 1930s (go here for a map showing the current location of the buildings). At last check, people are already adding their comments to the Facebook page. As they are in the habit of doing, Pennsylvania Military Museum shared tons of photos from their most recent Boot Camp for Kids event on Facebook. (You can find albums here and here.) This was the third year for the program; several kids have moved up in rank by participating multiple years. There is some serious teamwork going on in those photos and, just guessing here, some truly memorable experiences. With Tall Ships Erie 2013 just a month away, the Flagship Niagara League has announced the final program for the event, Sept. 5-8. There will be a wide scope of things to do (besides visiting the Erie Maritime Museum), with children’s activities, music, history talks, fireworks, and the opening Parade of Sail. (Go here for a detailed schedule.) 2013 marks the bicentennial of the Battle of Lake Erie, in which Niagara played a pivotal and decisive role. The ship has been out and about in the Great Lakes this summer at tall ship festivals in other cities (just took 2nd place in a challenge race from Duluth to Chicago), heads back to Erie to host TSE2013, then sails over to Put-in Bay, Ohio, for the official commemoration of the battle on Sept. 10. Last Gasp of Summer? Hardly! There have been lots of great programs at or related to sites on the Trails of History this summer; media (social and otherwise) bring them to you wherever you are. 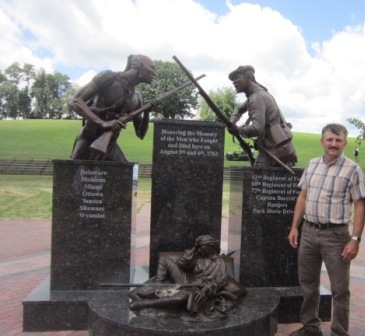 In the last couple of weeks, Pennsylvania Military Museum held their VIETNAM Revisited program, Flagship Niagara went to Duluth, Minnesota, as part of the War of 1812 Bicentennial, Eckley Miners’ Village hosted their 1940s weekend, summer camps were held at Old Economy Village and the Anthracite Heritage Museum, and Somerset Historical Center opened a photo exhibit featuring the work of photographer Walt Bowen and contemporary photographers. To name just a few. August promises more to come. Aug. 31-Sept. 1: Guided tours of Scranton Iron Furnaces—a rare chance for a guided tour (you can also check out the South Side Farmers Market on Saturday). The Scranton Times Tribune just posted a 1942 photo of the furnaces on its "Pages from the Past" blog. 11 am-4 pm. Aug. 2-4: 250th Anniversary of Battle of Bushy Run—events run from Friday evening through Sunday evening, with commemorative programs, a monument unveiling, battle reenactments and more. Official schedule and info is here. You can read more about the 250th anniversary here, here, and here. 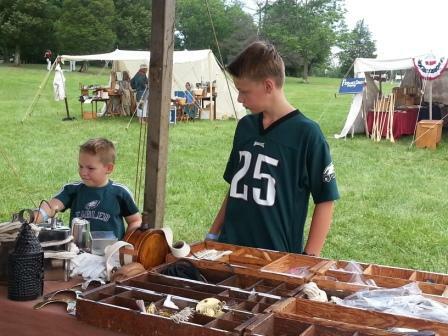 Aug. 4: 18th-century Interpretive Sunday—learn about life in Berks County in the mid-18th century. Noon-4 pm. Aug. 13: Lecture/performance by Ron Garman and The Heritage Trombones—learn about the history of the trombone and the evolution of musical styles during this unique program. (Go here for more info on Garman and other group members). Part of the Friends of Cornwall Iron Furnace lecture series, the program takes place in Freeman Hall auditorium at Cornwall Manor. 7 pm. Aug. 16: Cornwall Blast!—this event features local breweries and wineries, music by the Wayne Fox Trio, and actor Larry Sheaf as guest emcee; there will be “soft” refreshments suitable for designated drivers and folks younger than 21. Tickets are limited and must be purchased in advance (go here for all the details). 6-9 pm. Aug. 4, 18, 25: Interpretive Sundays—spend Sunday afternoons in August learning about candle dipping (8/4); militia muster (8/18); and camp cooking (8/25). Included in regular admission. Noon-4 pm. Aug. 7, 14, 21, 28: Sawmill Operation Days—subject to staff availability, there will be demonstrations of the site’s water-powered sawmill. Free of charge (admission rates apply to visit the historic area and the homestead). 11 am & 2 pm. Aug. 10-11: Battles at Boone: A Revolutionary War Encampment—billed as the largest living history event in Berks County since 2008, this program brings together military and civilian reenactors, sutlers, craftspeople, and more. For details go here. Adults, $10; Seniors, $8; Children, $6 (cash or check only, no credit cards). 9 am-4 pm each day. Aug. 3-4: Historic Pithole Open—the visitor center will be open, so enjoy the orientation film and the excellent diorama that shows the town in its heyday. (General location map is here—ignore the letter “A” and look where it says “historic site.”) 10 am-4 pm. Aug. 24: Drake Day—this year, the annual celebration of the first successful well drilled for oil will include a 19th-century circus program. Check the website closer to the event for more info or call 814/827-2797. Aug. 31: Oil Valley Blacksmiths Association—this monthly event brings local blacksmiths to the site to show how it’s done. Included in regular admission. 9 am-2 pm. Aug. 17-18: Living History and Civil War Weekend—encampments, demonstrations, and entertainment of the Civil War era. Go here for details closer to the date. 10 am-5 pm. Aug. 31: WYSO exhibit closes. Aug. 3: Craft Demonstrations—Join Ephrata’s Student Historians, expert spinner and weaver Ruth Konrad, and furniture maker and bookbinder Dave Hoffman as they share some of the crafts and skills of the 18th century (go here for more info). Included in regular admission. 10 am-4 pm. Aug. 4: Ice Cream Social—enjoy an evening of ice cream (pick your own sundae toppings) and music (vocalist Dean Sensenig) in a beautiful setting. Tickets are $3 and are available ahead of time (Museum Store or Visitor Center) or on the day. 4-7 pm. Aug. 13: Erie Gives—the museum and ship are participants in this year’s community-wide online fundraising drive. Go to www.eriegives.org any time between 8 am and 8 pm on August 13, make a minimum donation of $25, and Flagship Niagara League will also receive a prorated match from the Erie Community Foundation. Aug. 10: Summer Saturdays at the Fort—this month the focus is on the 250th anniversary of the siege of Fort Pitt. 10 am-5 pm. Aug. 25: Yellow Fever Living History Program—Philadelphia experienced a dramatic yellow fever epidemic in 1793. 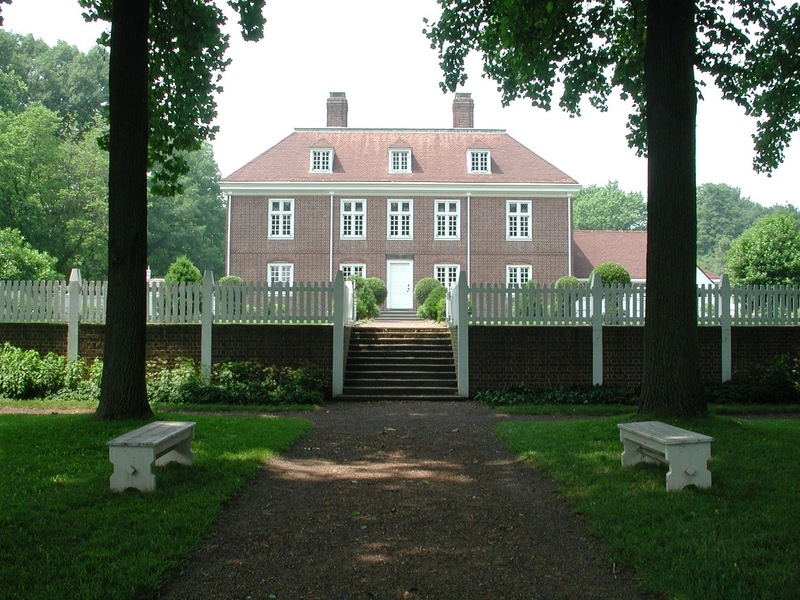 Graeme Park, like other country estates, became a haven removed from the city’s contagions. This program explores the impact of the epidemic on Elizabeth Graeme Fergusson and her circle of family and friends. Check the website closer to the date for details. Aug. 9: Movie Night—bring a blanket or lawn chair and settle in to watch Lincoln, winner of numerous awards including Daniel Day-Lewis’s Academy Award for Best Actor (James Spader steals a scene or two, IMHO). Presented by Whitemarsh Township Parks and Recreation. Rain date is Aug. 10. Starts at dusk. Aug. 4: Oxygen Day—in honor of Dr. Priestley’s best known scientific contribution, this program features costumed docents throughout the house (which includes what may be the first laboratory in America) and chemistry demonstrations. Free admission. 1-4 pm; chemistry demos at 1:30 and 3 pm. Aug. 6: Hands-On History Day—experience chores, games, and crafts from the past, take a wagon ride, and learn your lessons in the one-room schoolhouse. Cost is $10 per person. 10 am-3 pm. Aug. 10: Tales, Legends, and Lore—a full day of storytelling around the site, plus hands-on activities and wagon rides. Go here for the day’s schedule of events and admission fees. 10 am-4 pm. Aug. 7: Exhibit opening—enjoy light refreshments as you explore three new Visitor Center exhibits developed by OEV’s summer interns. Learn about Harmonist winemaking, forays into alchemy, and the history of the Rapp Houses (currently closed to the public for renovations). Admission is free. 5-7 pm. Aug. 14: Lecture—“Economy Village and Allegheny County” explores the relationship of the Harmony Society with the larger Pittsburgh region. Speaker is Dave Aitken, retired railroader, history buff, and OEV volunteer. Admission is free. 7-8:30 pm. Aug. 31: Gertrude Rapp’s Birthday Party—a full day of activities, with crafts demonstrations, ginger cookies, and ice cream. Included in regular admission. 10 am-5 pm. Aug. 4: Historic Trades—the blacksmith and the joyner will demonstrate their skills. 1-4 pm. Aug. 11: Living History Theater—“What’s New at Neshaminy” introduces the women of Middletown Quaker Meeting, who gathered monthly to discuss issues of concern in their community. Learn about some of the 17th-century topics they shared. 1-4 pm. Aug. 18: Open Hearth Cooking—it’s “cooks’ choice” today as the cooks select their favorite 17th-century recipes to share. 1-4 pm. Aug. 25: Garden Highlights—spend some peaceful time in the kitchen garden. 1-4 pm. Saturdays and Sundays: Guided Tours included in museum admission on weekends during the month of August. 1 pm only. 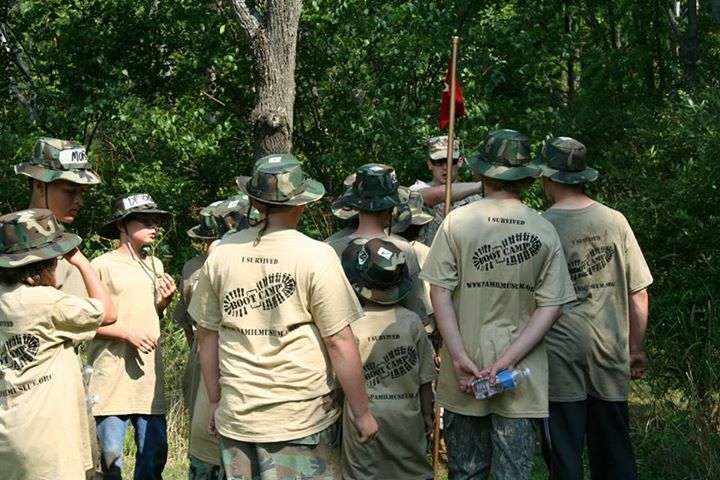 Aug. 3: Boot Camp for Kids—registration deadline was July 6, so mark your calendars for next year. Aug. 16-17: Hogwarts Express Parties—elements of the popular Harry Potter books come to life among the museum’s railcars and street scenes. The program is recommended for ages 8 and up (attendees must be accompanied by a parent or adult guardian). Space is limited; registrations are accepted by mail or in person, and all those attending over age 3 are also subject to museum admission fees. Go here for details and a registration form. 11 am, 1 pm. Aug. 1, 8, 15: StoryTime in Curiosity Connection—staff and volunteers read a different book each week, selected with children ages 3-5 in mind, and then direct a related play activity. This year’s series is dedicated to Dawn Dutcher, Curiosity Connection director, who passed away in May. StoryTime is included in regular admission. 10 am. Aug. 2, 9, 16, 23, 30: Learn at Lunchtime—the museum offers free admission mid-day every Friday, along with docent tours of select exhibits. 11 am-1:30 pm (docent tours noon to 1 pm). Aug. 11: Artist Conversations—this month’s installment features artist and photographer Carl Sander Socolow talking with State Museum photographer Don Giles as they tour the “Art of the State” exhibit. Included in regular admission. 1 pm. Aug. 16: 3rd in the Burg—this month’s program features the State Museum Planetarium. Free showings of “We Are Aliens” will be offered at 6:30, 7, and 7:30 pm. Aug. 5-9: Summer History Camp—“Travelers of Colonial History” is the theme for this year. Students who will be entering grades 3, 4, or 5 this fall are eligible to participate. Cost is $150. Call 215/493-4076 for more info and to see if there are spaces available.